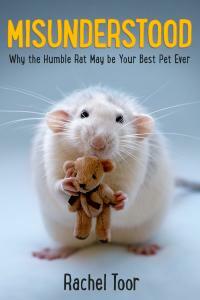 As much a moving memoir as it is an amusing pet manual, Misunderstood is a unique nonfiction book for teens and tweens about domesticated rats in general and a wonderful rat named Iris in particular. Brimming with smarts and energy just like its furry subjects, Rachel Toor's text blends history and science with profiles of interesting people and autobiographical anecdotes as it joyfully sets the record straight about why this reviled creature is actually a most amazing species. Readers will come away with a deeper understanding and appreciation of domestic rats, and may be convinced to adopt one themselves. "In this irresistible memoir-manual, Toor interweaves scientific studies, autobiographical anecdotes, and surprisingly riveting research to dispel deep-seated—and often unwarranted—anxieties about Rattus norvegicus, or pet rats. Centered on her three-and-a-half-year love affair “with someone the size of a hot dog bun," the ever-inquisitive Iris, Toor talks tails (they’re used for thermoregulation), travel, domestication, veterinary care, and rat types. Notably, Toor consistently couples scientific findings with her own effortlessly engaging narrative. With its photo-marked chapter breaks, handy further reading suggestions, and conversational tone, this is not only a useful resource for future rat owners and ardent animal-lovers but also young essay writers. Get ready to scour ratteries near you!" "Part pet-centric memoir and part broader commentary on animal-human relation- ships, Toor’s thoughtful and often humorous musings about pet rats, including and especially her own beloved rat, Iris, make an absorbing read...Readers who loved Hodgman’s The House of a Million Pets (BCCB 11/07) and those interested in animal behavior in general will find plenty to pore over here."